When we got married, I knew that wedding china was definitely going on our registry list. I love to entertain, and have dreams of throwing big, lavish sit-down dinners for friends and family. Some day. For now, our tiny, non-expandable, condo-sized table for four will have to do. Two to three guests at a time, check. Once, we tried the awkward "add a bigger table next to the circle table" thing. But that wasn't so successful. No one wants to sit on the curve of the table! So a dinner party was in high order! And hooray, sure enough, the china definitely upgraded the experience, from first course to coffee service. 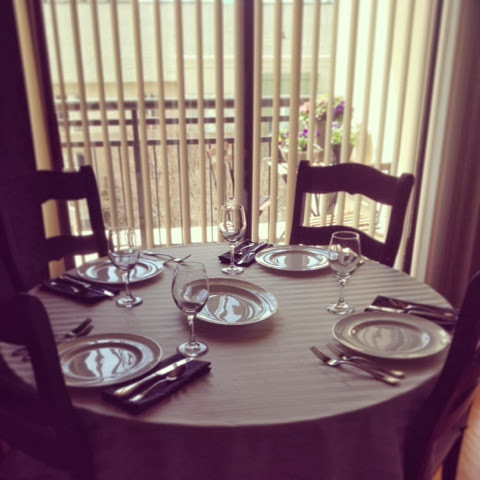 I did what I always do, a trick that I learned from my mom - set the table first thing that morning. It not only gets the atmosphere right, but it's usually something you will want to take time with, so why not get it done first? I ironed the tablecloth and napkins, spent time pulling out the right plates and utensils, and then put it all together. The weather was gorgeous, the door was open -- it was pretty much a perfect start to the day. * Mahi Mahi with Braised Tomatoes - Based on a Bacchanalia recipe from a cookbook we received, filled with famous dishes from tons of great restaurants around the country. The fish was light, and finished in the oven, making it easy to prep. * Gratin of Belgium Endive - A Cooking Light recipe I tore out in 2009. Made it for the first time, and would definitely enjoy this one again! It paired well with the lighter fish and tomatoes, but as a Cooking Light recipe, it wasn't too heavy, like a true gratin might be. * Malted Chocolate Pecan Pie with homemade whipped cream - Recipe from the Four and Twenty Blackbirds cookbook that I received at Christmas (thanks, Adrienne and Tim!). Oh my. The filling was amazing. The crust, I need to try again, now that I have made it once, but I could tell it will be stellar when I get it just right. It was all so good together! We chose the recipes partially by what would be seasonally appealing -- no need to make a stew when it is going to be 70 degrees outside! -- and also easy for us to prep while still spending time with our guests. The pie was the most time consuming, but I could make it in advance, along with the tomatoes. The endive, we also prepped in advance and just threw in the oven to brown when guests were due to arrive. That way, it was done around the time we were ready to eat. The fish was the one item that needed a little last minute attention, but it was a quick task, and one that the hubs could do while talking about beer with my dad. Have you thrown any dinner parties recently? What did you choose to make? How did it go?! Yay for using wedding china, you know I love it :) Such a lovely dinner setup!